Progress report and a personal thank you to Daniel B. Well just a little update for you all on my progress so far. Hmmm let's see not sure where to start. Oh yeah I GOT MY CDL!!! Can't tell you how good that feels to say!! I have been documenting my progress in the CDL TRAINING DIARIES section of the forum for anyone that is interested. But I wantedc to take a minute to thank everyone for all the encouragement they have given me. This website has been an absolute blessing and I really doubt I would be here holding my CDL without this site and without the support I have been blessed with by so many of you. One person in particular is Daniel B!! Daniel had gone through Centrals training and worked for them and was kind enough to call me and tell me exactly what to expect before I even got to school! I can't tell you how important that was to me because once I didn't get to school I got a different story with every person I talked to, but the reality was exactly like Daniel described it!! To add icing to the cake as luck or fate would have it, I had the honor of meeting Daniel the day before my final road test this week as he was in town waiting to pick up a load. Daniel went out of his way to come out and meet me and show me his awesome PURPLE truck...yes guys its PURPLE NOT PINK!! And it is awesome. What an awesome human being! Daniel, you were there with words of encouragement when I needed to hear them and just the right doses of reality when I needed it as well. You have been so generous with your time I just can't tell you how much that means to me. I could not have done this without you and ill never forget it - thank you my friend!! As for me I am almost done with orientation and will be keeping you all updated so if you want to follow along, once again that thread is in the Truck driving school diaries section. Just a couple more days and I will be able to change my status to "Driver in Training"
Thanks again everyone from the bottom of my heart!! Well it all comes down to today - the road rest. The grand finale! Unfortunately it is the one I am fearing the most and the least confident in and the MOST nervous about! So testing is being run the same as all the other tests so I know I am going to go first. I figure since I am not going to get any practice time in between now and ever I am as good as I am going to get so I might as well get it over with. We get out of the parking lot and onto the road and I find myself shifting ....perfectly!! We go through an industrial area and a couple stop signs and I manage to have plenty of time to down shift and stop and I do so flawlessly!
" wow what is happening !?" I am thinking to myself. We get out on the city streets and I get nothing but green lights. The examiner the asks me to get in the left turn lane and get on the freeway and the first sign of trouble comes as I grind my gears horribly the good thing is I figure out my problem pretty quickly - I forget to switch the selector!! But I recover and we begin crushing down the freeway. I keep reminding myself to keep track of what gear I am in when he asked me to exit. We start heading down a road and he asks me "what did the sign that we just passed say?" I am honest and say "I don't know" the real answer was "I don't know I am trying to concentrate on what gear I am in!!" He says "I appreciate your honesty"
We get to the end of the road and he says "ok take a right up here and we will head back"
I can't believe we could possibly be heading back it feels like I have only been driving for ten minutes but yes we are heading back. And somehow on the way back - all green lights AGAIN!! Even the examiner comments on it. Before I know it - we are back in the yard and stopped. The examiner tells me " I had to take a point for your gears at the freeway on ramp and for missing the sign so you lost a total of TWO POINTS congratulations YOU PASSED!" Next step off to the DMV to get my Class A CDL!! I can't even wrap my brain around that! It was not long ago when I first found this site and I had to really jump through some hoops to even get into school but I am now the proud holder of my CDL!! I have to thank everyone for all their support and I have to say a special and heartfelt thank you to Daniel B. I forgot to mention that I have been talking to Daniel off and on and he's been keeping me sane and telling me what to expect and giving me constant encouragement and as luck would have it I had the great honor of meeting him yesterday as he was in town picking up a load. What a great guy and with all the rumors that you hear in school it was such a blessing to have someone that actually knows what they are talking about and what to expect. Daniel you have been so generous with your time I couldn't have done it without you and ill never forget it - thank you my friend! And for everyone else that has been cheering me on - again I will never forget the support and encouragement you have given me. What a world!! Tomorrow I start orientation for Central I will of course keep you all updated with my progress!! So the second part of testing today consists of three backing maneuevers- a straight line back, a parallel back and an offset back. I have managed to get a good amount of practice in with all three of these maneuevers so I am feeling pretty confident in my ability to complete them flawlessly. The one thing that I overlooked was the fact that I practiced every single time using the same truck and my test was going to be on a different truck. I was hoping this wouldn't have much effect on my success but it did...but not enough to fail me! I wanted to complete them all without using any pull ups but we were allowed one free pull up for the straight like back and two free pull-ups each for the parallel and the offset. I manage to get close on the parallel but wasn't comfortable with my position so I used one pull up and got into the box perfectly then on the offset I was actually just a little off but decided to just back it in and did so flawlessly I passed all three tests without any points taken off - so technically I would call that PERFECT!! Two down one to go - road test is tomorrow. Well needless to say I didn't sleep very well last night. I thought I had my pre trip down but now for some reason I am starting to panic. The test on the pre trip inspection is going to be administered first and the 3 way brake test is a mandatory part of that test. Failing the 3 way break test is an automatic failure of the whole pre trip. Unfortunately the 3 way brake test is the ONLY part of the pre trip I am not prepared for. I start to get angry with myself for not being prepared but finally calm myself down and start to focus on the problem. I decide instead of going over and over the entire pre trip I just need to focus on the 3 way brake test since that is the only part that MUST be done perfectly. So I start to memorize the brake test and hope that I have a little time to reinforce it in my head while others are testing. So they begin to call the names for the five groups they are going to be testing and as my luck would have it I am called to test first in the fifth group!!! I am nervous as hell as I walk to the truck going over and over the brake test in my head. I am asked to do a form one pre trip and I did the best I could but was not real confident then the brake test comes and somehow I do it flawlessly! When all is said and done the examiner tells me I scored a 46 out of a possible 47!! Wow what a relief! Bring on the backing test! it's hard to believe an entire week has gone by since I started class here in Utah. Yesterday we got to see more great examples of how beautiful this state really is. It made me excited to get out on the road an see a whole lot more of this beautiful country of ours. Today is going to be all about practice we have a good portion of the day to do nothing but practice our backing skills and our pre trip inspections since we will be testing both of those tomorrow with our road test on Monday!! I am fully confident after going through all of the backing maneucers two more times that I should have no problem passing the test. I am a little less confident in my pre trip inspection especially the brake test so i decide to spend the rest of my time working on that. As I am getting ready to work on that I notice a couple of my classmates watching another guy struggle on the parallel parking. They say that he is about to take his test for the last time and if he fails he goes home. I decide to help him because I notice immediately that he is not getting the trailer deep enough in the box for the last part of his approach. I show him how I do it - he is psyched and will go on to pass his test. I feel pretty good about helping someone out but still need to practice my pre trip . The last couple hours of the day are spent doing map reading and mock trip planning I am shocked at how many people have no clue how to read a map! Tomorrow is the first of two test days. Training today consisted of some city driving and some mountain driving. I am gradually feeling a little better about shifting and driving in general. I am not perfect by any stretch of the imagination but I am gradually feeling a little more comfortable behind the wheel. My biggest struggle has been with downshifting. Getting those RPM's just right has been a little tricky. Also as I mentioned earlier a lot of years of bad habits in my regular car definitely not helping me now. One of the guys in my group has never driven a clutch in his life and he is definitely picking this up faster than I am. By the end of the day I am not as confident as I would like to be and our road test is only a couple days away. Well we arrive once again at seven in the morning and the head instructor who is also MY instructor comes into the classroom and announces "today we are going to be working on parallel parking"
I immediately laugh at loud because over the past couple days I have really come to appreciate his twisted sense of humor and I completely thought that this must be him being his weird funny self. But the look he gives me tells me somehow he is serious. My mouth instantly goes dry and my legs begin to feel a little weak. I can't help thinking to myself " a week ago I had never even been inside a semi and now I am going to parallel park one??? And a trailer?!! Wha?? HOW DID I GET HERE??!!! However the good news is - this is also pretty damn easy. I see several of my classmates struggling to get this but I pick up on it right away. I take it as a pretty good sign that after a couple times of me doing it perfectly, the next two times my instructor says he has to make some phone calls " don't hit anything" he says and leaves me to it! This made up for everything that went wrong yesterday and I even end up helping a few of my classmates get their technique down. Well the first part of the day is spent learning how to "offset back"
This is apparently a pretty standard and basic backing maneuver and once the steps are explained it sounds pretty easy and I was pleasantly surprised that it was in fact pretty easy. However doing it consistently right and getting it centered in the box without having to do a "pull up" proved to be a little more difficult. The offset is performed when trying to back into a space that is roughly a truck width to the side of your vehicle - in this case the drivers side you basically pull up as far as you can past the space to your left. When you are ready you simply turn hard right until you see half your right side landing gear in your drivers side mirror and by half I of course mean vertically. Then you turn the wheel hard left until you see half of your left side landing gear in your passenger side mirror. You then turn hard right again and back up until you are straight at which time you should be roughly centered in the space you are attempting to back into directly behind your vehicle. The rest of the day is spent driving around an industrial area with a few side streets thrown in. I have to say that two different "me's" drove today. Rob before break drove pretty good and rob after break was a total disaster. Somehow I seemed to have forgotten everything I had learned. I kept forgetting what gear I was in and coasting and grinding and my instructor is not to pleased with my performance. I have to say a huge thank you to Daniel B. for sending me encouraging words when I texted him I was feeling pretty down but he said it was totally normal and everyone has days like these it totally snapped me out of my funk and gave me hope again because I honestly was starting to doubt if I could ever really do this job. Somehow it is already Wednesday and today we will actually be "driving"!! There is a very long what appears to be some kind of deserted road that central affectionately calls "Rookie Road"! However it is absolutely perfect for today's lesson. We are just learning how to steer, accelerate, stop and the dreaded double clutch and shift. There are four of us with our instructor barking out instructions. I'm not going to lie it is a little intimidating and we are all a complete disaster and for a minute or two I am thinking "what the hell have I gotten myself into"??!! But by the end of the day I am feeling pretty proud of myself because I can smoothly go from second to fourth with no problem!! Lol. Then they have to go and throw a wrench into the system by telling us there are MORE GEARS! And you have to "switch" between the high gears and low gears with a little switch on the gear shift. Now I am starting to break into a cold sweat. All those years of bad habits of driving my car and coasting to stop lights with my clutch in are definitely coming back to haunt me. I'm a little nervous - tomorrow we are going to practice turning! So welcome to day two of phase two training. First of all let me say that Utah is absolutely beautiful. I mean I love Seattle and Washington State is pretty as well but I don't think I've ever been anywhere that is so clean. Today consists entirely of learning how to drive a tractor in trailer in low gear and back up in a straight line. This all takes place in a giant parking lot with snow covered mountains just off in the distance. Central refrigerated is a actually located in West Valley City, Utah just about 15 minutes outside of Salt Lake City. It seems to me they are a little short on training at least today. The truck we are learning in is a Volvo and right now there's are about 9 of us taking turns pulling forward and backing up in "lane 1" there is one instructor teaching two groups at the same time in lanes two and three. I am immediately impressed with how little effort it takes to steer these things a little turn of the wheel and the trailer instantly reacts. It takes very little effort to get the trailer straightened out but also it doesn't take much to get yourself really crooked really fast - I experienced both today! So after the greyhound trauma and arriving in Salt Lake City we were picked up by the central shuttle and taken to our hotel rooms it is early Sunday evening and first day of class is 7 am Monday morning. So day one consists of paperwork and being shuttled to the DMV to take our permit tests. First you have to take the regular state of Utah drivers license test but considering it is an open book test it should not be too difficult having said that there was one guy in our group who failed. I am not kidding. So anyway I am happy to say I passed my permit test on the first try and am now the proud holder of a state of Utah CDL permit. Hey everyone - sorry I have been short on the updates but I have been up to my elbows in phase 2 training here in Salt Lake City. So let me break down how things are progressing so far. Thanks Jim I appreciate it - I am moving right along. Starting phase 2 now. Well if you have been following along this far it should be no big secret what today is all about. One word FINALS!! So the final exam is administered which again is just a master test of all the preliminary tests that we took yesterday. It is basically the CDL written exam except it is not official. So the exam was handed out and I am happy to say that I passed with flying colors. I am also very comfortable in saying that the only reason I passed is that somehow through the crazy things that happen in this world I happened to find my way to this website and to this forum and to the high road training program. If I had not had these resources available to me, I am not sure if I would have passed...but I did....thankfully. So day three began with more safety videos. Learning about rollovers and other hazards that come with driving an 80 thousand pound vehicle. The general idea here is that for the classroom portion is all about the basics but focusing specifically on three specific areas - General knowledge, Combination Vehicles and Air Brakes. After finishing the safety videos and one more on shifting we were set to take our "pre-tests". The preliminary tests were made up of 50 questions in the general knowledge category, 20 questions relating to air brakes and 20 questions relating to combination vehicles. We were going to take a series of three tests for each category, so nine tests total.....all today. Having started The High Road Training Program, I felt pretty confident in my ability to test well, however I had not quite finished the sections on Air Brakes or Combination Vehicles. So we did the first test and I missed a couple on the general knowledge part and a couple on the combination vehicles and totally fell apart when it came to air brakes. The good news is that is why they do their tests this way,..the prelim testing is just to give you an idea of what is going to be on the tests. The reason they do a series of three is to hammer the questions they seem to be certain are going to be on your actual CDL written exam and then give you as broad of a base of other questions as possible. There were many questions that were consistently on all three exams but I am certain there were also questions that only showed up one time on each prelim. So I had to take the air brakes portion of the first round of tests and I passed successfully and moved on to the second series of tests. The second series of tests went down just like the first, 50 general knowledge questions, 20 air brakes questions and 20 combination vehicle questions. We had to score an 85% or better and unfortunately THIS time I just barely missed passing the combination vehicle portion of the prelims so I had to take that part over this time, which I passed on the the second try. The third series of tests was just like the first two and I passed but with my goal of getting 100% on everything I do I was a little down and to tell you the truth very concerned. Tomorrow is the final test which will combine all three tests from today into one...in other words...tomorrow there will be 150 general knowledge questions, 60 questions on combination vehicles and 60 questions on air brakes. We don't get to re take any portions of the test and we must score an 85% or better or we do NOT move on to phase two training which means if I fail I do not go to Utah - needless to say FAILURE IS NOT AN OPTION. Day two consisted of going over some of the stuff we learned in day one with some pop quiz material thrown in. We focused pretty heavy on learning how air brakes systems worked and basic principals of combination vehicles including coupling and uncoupling trailers, tandem axle adjustments, cargo, and safety safety safety. Towards the end of class today we watched a series of videos that I can only describe as making me break out in a cold sweat. There were several dash cam videos that showed actual accidents as they happened. One video from one truck dash cam captured another semi passing on the left and traveling way two fast for conditions, the driver switched lanes too quickly and the trailer rolled pulling the tractor with the driver inside off of the right shoulder of the highway and off of a 180 foot cliff obviously killing the driver instantly. Another dash cam video showed a vehicle up ahead of the truck traveling in the same direction but a little too fast for conditions. It was snowing and the roads were clearly becoming dangerous. The vehicle in front of the truck started to slide and veered from the left lane to the right lane bumping into another car that was in the right lane. The vehicle then over-corrected its steering and accelerated which caused the vehicle to cross over the divider into on coming traffic right in the path of another semi coming down the mountain. The out of control vehicle was instantly demolished and smashed into about a million pieces...again...obviously killing the driver of the out of control vehicle and injuring the driver of the semi that struck it and I am sure traumatizing him for life even though there was absolutely nothing he could have done to avoid it. It just really shook me up, this job is NO JOKE!! Things can go terribly wrong the blink of a freaking eye and you can never be too careful. To anyone taking any of this lightly...stop now and look for another line of work. This is not for you. This is not to be taken lightly, this is serious business and you could get yourself or somebody else killed if you get complacent for even a damn second. Please....always pay attention, always be safe, always know what is going on around you at all times. The truly sad part about all of the videos we saw is EVERY single one of them could have been avoided. Almost all of them were caused by driving too fast for conditions. Slow down. Speed DOES NOT save time. Hey Everyone. As promised and as a way to give back to the awesome support this website has provided me I wanted to give a detailed description of my experience as I muddle through training. If any of you have followed my saga so far you know that just getting into this program took some serious jumping through hoops on my end. With the encouragement and support of many here on this website and some family and friends I somehow landed myself in Central Refrigerated's training program which for my local area anyway was run by TDA. DAY 1 - Day one started at 7a.m. Monday morning in Federal Way, Washington which lucky for me is just a few miles up the road from me. and after being briefed on what we could expect from the program. We were handed an enormous stack of handouts and paperwork to fill out and right about an hour later were sent to a local clinic to do our DOT Physical and drug and alcohol urine tests. The physical consisted of an eye exam, a whisper test, blood pressure check, reflexes, hernia check. (turn your head and cough while the doctor has your undivided attention if you know what I mean) and just your basic history and health screen. The drug/alcohol screen consisted of urinating into a cup - no hair follicle or blood test. After returning to class and completing the rest of the paperwork we were given the lowdown on what to expect. The phase one part of the class here in town will be four days long. We will be learning general knowledge about safely operating a CMV with a primary focus in three areas - General Knowledge, Combination Vehicles and Air Brakes. The third day of class we will be given a series of "preliminary exams" in three different combinations of answers with a "hope" of scoring 85% or higher on all three sets. The fourth day of class will be the final exam, one test which will combine the previous answers from Wednesday's preliminary test - so one final test with a REQUIREMENT of scoring 85% or better. If you pass you are given a confirmation number to get your ticket to phase 2 training which will be in Salt Lake City Utah. The greyhound bus will leave the Saturday following class. Phase 2 will take place in Salt Lake City and consist of 3 weeks of driving practice and more general knowledge training. Upon successful completion of Phase 2 training (I am not entirely certain exactly what will constitute successful completion of phase 2 as I am not there yet) you will move on to Phase 3 training. Phase 3 training will consist of being out on the road for one on one training with your instructor delivering actual loads for 28 days. After completing this phase you will return to the Salt Lake City terminal and test out at which point you will be issued your truck and dispatched for your first solo delivery and you will be a real truck driver. The rest of day one consisted of watching some videos and going over some of the handouts we received. At a crossroads and in need of direction!! Hey guys sorry it has been a few days since I have updated everyone but I have been up to my elbows in classwork for the last 3 few days. Just to bring you up to speed I am done with day 3 of my local classroom training and tomorrow is my final and assuming everything goes as planned I will be off to Salt Lake City on Saturday to start the hands on CDL training for Central Refrigerated. It felt great to update my profile status to "IN CDL SCHOOL" today!! So as promised I will be keeping a detailed diary of not only this week but the Salt Lake City experience. Just want to say once again THANK YOU to all of the support and encouragement I have received from this forum from everyone I have been completely blown away by the community here and all the words of encouragement and even some of you taking your time to talk to me on the phone or email me, I am totally blown away and just can't express my gratitude enough. It has truly meant the world to me. You are all some very amazing people. So keep an eye out for my on going journey which I will post in the CDL training diaries section of the forum. Thanks again everyone and hopefully before too long I might be seeing some of you out there on the road. That would be amazing!! Thank you so much. I sent you a PM!! Thanks brotha! Well guys, I can't stop smiling today!! After several days of legwork, running around to courts, getting tickets paid off, dealing with collection agencies, going to DMV and getting my applications filled out, I am happy to announce some great news. 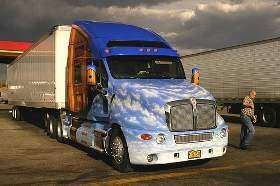 I have been accepted to Central Refrigerated (now a Division of Swift Transporation) and start class on Monday March 31st. I have week one classroom training just a few miles up the road from my house and then the following Saturday I head to Salt Lake City for real training and upon successful completion I will head out with a trainer for 5 weeks or so before being issued my own truck in a homebound direction and be running solo!! Just goes to show, where there's a will there's a way. Don't let anything stand between you and your dreams....not ONE thing!! I can't express my gratitude for the continued support and encouragement I have received from so many of you on this forum and like I promised from day one I will be keeping you all updated on my progress. I have a strong feeling you are going to get sick of me in the very near future!! So in the meantime, I am continuing the High Road Online Training Program to get a leg up on everyone else. I will be setting high standards for myself, failure is not an option but my goals are to ACE every single test....100% across the board.